Adding fruit to savory dishes is one of my favourite ways to use them; they add a pleasant sweetness, which plays well with the neutral taste of summer squash. The stuffing mixture also works well in peppers and eggplants, or on its own as a salad (sautéing the leeks first). Make rice according to package directions. You can do this step in advance. Meanwhile, using a melon baller, hollow out summer squash or zucchini. Reserve innards for another use (like the Fruit-Infused Ratatouille). 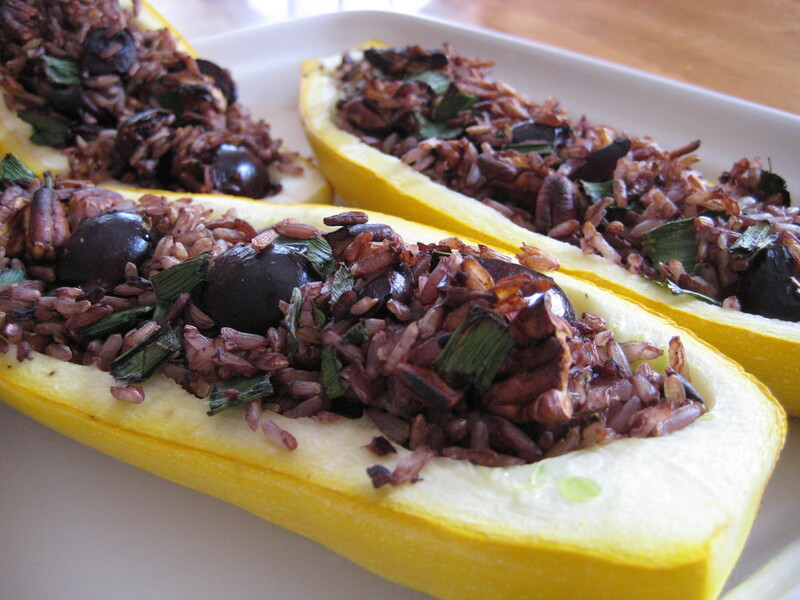 Place squash or zucchini on a baking sheet. When rice is finished, preheat the oven to 425 degrees F. Mix the pecans, cherries, leeks, and thyme with the rice, adding salt and pepper to taste. Scoop the mixture into the squash and zucchini. Bake for 15 to 20 minutes, until the squash and zucchini are soft, leeks are tender, and the cherries begin to omit juices. Serve warm or at room temperature.